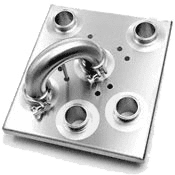 AWI works with your configurations to create attractive, heavy duty, stainless steel flow plates (flow verters) for the food and dairy industry. High quality, durable flow plates with a superior steel finish is a standard expectation of working with AWI. Constructed of either T-304 or T-316 S.S. Contact AWI Manufacturing or fill out our online Request for Quote form.